Novel treatments for mental health problems. Novel treatments for alcohol/other drug use problems. Integrating technology into healthcare for mental health and alcohol/other drug use problems. Supporting family members and friends affected by a loved one’s mental health or alcohol/other drug use problems. I am really interested in understanding why and how things work. I always have been. I also really like inventing new ways of doing things and having the time and space to think about problems we haven’t yet solved and trying to solve them. Research provides me the opportunity to do this every day, in a particular area of passion for me…mental health research. I like to imagine a future where everybody who has a worry about their mental health – or that of their family members or friends – has hope. Hope of a cure, hope that there is effective help available, and hope that they will be able to find that help when they need it most. That is what I work towards every day with my research. Developing treatments that work. Discovering ways to get those treatments into the homes and hands of people who need them. Partnering with other scientists to unlock a cure. I have another goal. Mental health research receives 9% of the medical research budget, despite being responsible for over 14% of the burden of disease. In the private sector, this situation is much worse, with cancer receiving 22 times the philanthropic donations that mental health research does. If we are to realise the above vision, then we need to ensure that mental health research receives at least comparable funding to its burden. I am on a mission to make this a reality. 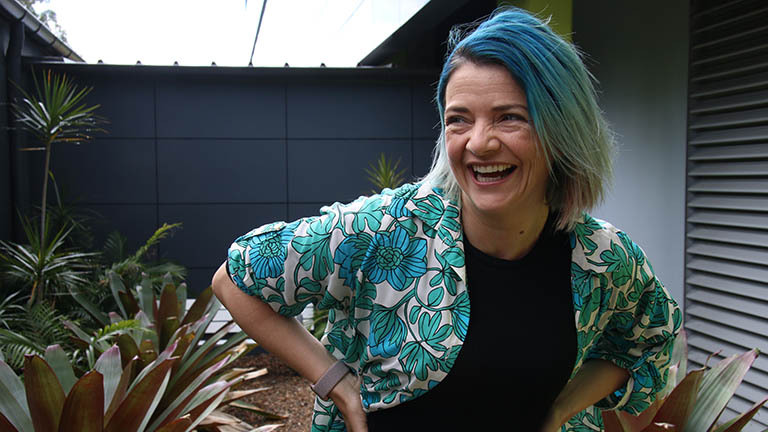 Professor Kay-Lambkin is a NHMRC Senior Research Fellow, Director of Translation at the NHMRC Centre for Research Excellence in Mental Health and Substance Use, and Co-Director of the Mental Health Hub of the University of Newcastle’s Priority Research Centre in Brain and Mental Health. She leads an international team of researchers, clinicians and industry partners in the innovative development and translation of evidence-based treatments for comorbid mental and physical disorders. Professor Kay-Lambkin leads an innovative and challenging research program, which brings together multidisciplinary national and international collaborators in her area of interest. Her vision is to bring high quality treatment for comorbidity to the point-of-care for people experiencing mental and physical disorders, to ensure that the right person receives the right intervention at the right time. This involves developing clinically safe and efficacious interventions, conducting controlled research to better understand how these interventions translate into clinical practice and general population settings, and linking with basic scientists to better understand the key mechanisms and components of change for these interventions for different patient groups at different stages of disorder. My vision is to continue to lead developments in the treatment of comorbidity so that people experiencing these burdensome conditions can directly benefit from my efforts. I will do this by building on my existing research grants and submitting further research grant funding; continuing and expanding my national and international collaborations in these efforts across disciplines; partnering with industry to secure research funding for translational studies that utilise my research outputs; and seeking new opportunities to engage with the business sector to develop technological solutions to clinical problems. I will work closely with clinicians, policymakers, key groups in the community who are experiencing mental health problems or are supporting people who do and will expand my efforts in supervising and mentoring postgraduate and postdoctoral researchers and clinicians to build capacity in this important field of research. I look forward to continuing my trajectory as a NHMRC-funded research fellow, in partnership with UON and HMRI, and to capitalising on the exciting and challenging opportunities that my research program presents in the future. Deputy Director (Mental Health), Priority Research Centre for Brain and Mental Health, the University of Newcastle. Director, Technology, Innovation, and Translation, NHMRC PREMISE Centre of Research Excellence. Visiting Fellow, Black Dog Institute, University of New South Wales. Chair, Research Review Committee, Orygen, the National Centre for Excellence in Youth Mental Health. Chair, Research Strategy Committee, Black Dog Institute, University of New South Wales. Academic Member, Human Research Ethics Committee, UON. Chair, Callaghan Community Drug Action Team, UON. Editorial Board, Journal of Clinical Medicine. Section Editor, BMC Public Health. Editorial Board, Drug and Alcohol Review. President, Society for Mental Health Research. President, International Society for Research on Internet Interventions.